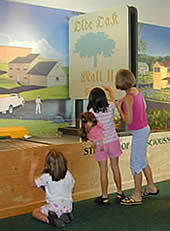 Visitors step into Pavilion One to explore the Manasquan Watershed at the fiber optics map. They can activate the map to follow a rainstorm through the watershed to the Manasquan River and then to the ocean. Nearly every drop of water that reaches the Manasquan River first flows through the watershed. Visitors learn how a portion of this water is saved for future water needs at the Manasquan Reservoir. Also included in this exhibit area are a diagram of the water cycle and a collage of pictures illustrating the many forms of water. Animals that inhabit wetlands have adaptations that help them survive in a liquid habitat. This display shows what inventions humans have developed to allow them to use the same environment. Every day we make choices that affect the environment. In the two towns depicted in this exhibit, people have made decisions that will affect the environmental health of their surroundings. One town has allowed unmanaged growth without considering the effect on the land and the wildlife in the area. The citizens of the alternate town have chosen to establish practices that protect the natural environment of their community. This exhibit poses the question: Which town would you rather live in? The online reservation system is a quick and easy way to book at tee time at one of 6 golf courses. From Seven Presidents Oceanfront Park to Historic Walnford, the Park System offers over 30 park areas to explore. From pottery classes to nature walks, programs and activities are a great way to meet people and explore new interests. Learn about our inclusion services and supports. Receive timely updates regarding Monmouth County Park System programs, special events & golf course promotions.